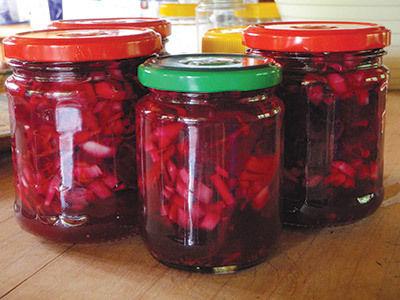 There comes a time every summer when daily demand is outstripped by supply and the preserving pan comes to the fore. 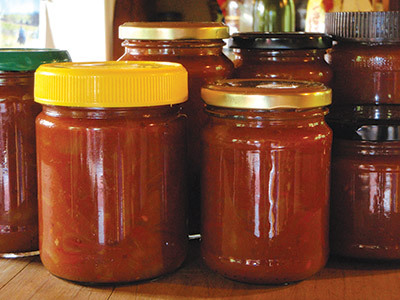 Preserving can be a great activity for family and friends, with the slicing, dicing and stirring being shared around. It’s a good time to talk and share news and discuss ideas. With the addition of vinegar, sugar and spices, jars, shelf space, the freezer and the dehydrator, we attempt to make use of the surplus produce. Gardening in this benign climate, which includes the orchard, free foods and the managed vegetable area, we have plenty of fresh food year-round. So while we don’t have to preserve to provide out-of-season food, we like to add taste variety and try to minimise the waste. Zucchini pickles make use of zucchini which, as you may know, is one of my summer preoccupations! These easily grown vegetables are often in oversupply so it’s good to make some use of those we can’t eat immediately or give away. They provide plenty of eating for vegetable bakes, curries, in stir fries, pickles and breads, cakes and muffins. I was given this recipe years ago and have modified it to suit myself. Zucchini carry a flavour well and hold their shape when cooked. Wash and trim the ends of the zucchini and slice them thinly. Finely cut the onions and put them with the zucchini into a large ceramic kitchen bowl. Cover the vegetables with water, add the salt, stir and allow to stand for one hour. Put the vinegar, sugar, seeds and turmeric into a pot and bring them to the boil. Rinse and drain the zucchini and onion after one hour, pour the spice mix over them, stir and let stand for another hour. Bring the mixture to the boil, thicken with the cornflour and water it will still be a thin mixture. Simmer for three minutes then put in hot sterilised jars and seal immediately. Time to prepare and cook: 2½ hours total. Makes about 4-6 medium jars. Keeps for 8-12 months and is great with cold meats, cheeses, salads, on crackers, with curries, hot boiled potatoes, baked kumara and any other food combo you fancy. Sterilise glass jars in the oven for 20-30 minutes at 130°C. Clean all lids by pouring boiling water over them and leaving to air dry. Do not mix vinegar with any metal other than stainless steel or enamel. Avoid aluminium and cast iron. Work quickly and cleanly, taking care with hot jars, pots of boiling liquids and transferring hot liquids. Stand hot jars on a folded towel or a wooden chopping board when you take them out of the oven. Store your jars of preserves in a cool, dark cupboard after leaving them on the bench or table for a few days to enjoy the visual effect. This relish is quick, easy, and, best of all, unfailingly delicious. Adaptable to lots of uses, it is a household staple here and thoroughly enjoyed. While it is a standard old Edmonds Cookbook recipe, I have changed it over time to suit our palates. That is one of the joys of relishes, chutneys and pickles adhering to the basic quantities ensures success, then the add-ins in the way of spices and flavours can be adjusted to suit personal whim. Roughly chop tomatoes and onions and put into stainless steel pan. Sprinkle with salt, stir and leave about eight hours. Pour off liquid and add the sugar and chillies to the pan. Add enough vinegar to just cover. Bring to a boil then simmer for 1½ hours. Mix the remaining ingredients with a little cold vinegar to a smooth paste. Stir into mixture and boil for five minutes. Put into hot sterilised jars and seal tightly. Time to prepare and cook: less than two hours, not including soaking time. Makes 6-8 small to medium jars. Beetroot is a fast and easy root crop to grow, giving good eating in return for medium effort. Then it will hold in the ground over the cooler months and continue to provide many meals roasted with a few garlic cloves or onions with a drizzle of olive oil and balsamic vinegar grated raw into salads cooked then sliced and with a little vinaigrette over it and a few handfuls of freshly chopped herbs such as chervil or parsley, it’s a great winter salad. 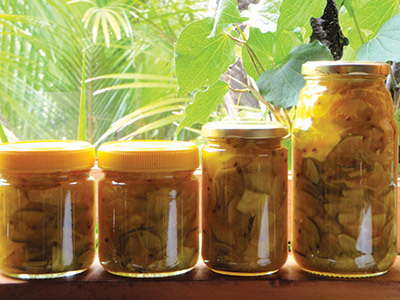 This pickle is a lovely rich colour and is delicious with a big mound of mashed root vegetables such as parsnips, swedes, potatoes or kumara. Goes well with cheese and sliced deli meats as well. Put the beetroot into a pan, bring to the boil and simmer until cooked. Drain off the water and when the beetroot are cool enough, slip off the skins, tops and tails then slice thinly. While the beetroot are cooking, bring the vinegars, sugar and black peppercorns to the boil and simmer for 5- 10 minutes. Let cool. Into a bowl put the sliced beetroot, onion, and citrus zest. Mix them together then spoon into hot sterilised jars. Pour the spiced vinegar over the beetroot to cover and seal. Time to prepare and cook: up to one hour. Let mature for at least a month before eating. Makes approximately 4 medium jars. Old-fashioned greengages are good for fresh eating but are equally good made into jam. The main jam eater in the house likes to make about 30 jars for a year’s eating so is keen to pick and preserve when the plums are ripe. Jam is best made in small quantities. Somehow it seems to jell better so having two medium-sized pots bubbling on the stove is better than one large one. Wash plums and take off any stalks. Put in pot with water and cook gently until the plums are a pulpy mass. Leave the stones in at this stage. They help the jam set. Add the sugar and boil quickly for about 15 minutes. After about 10 minutes, start scooping out the stones, which will rise to the surface. Test for “set” by putting a teaspoon of jam on a chilled saucer and if it forms a skin, it is ready. Pour into hot sterilised jars and seal immediately, either with lids or cellophane tops held with rubber bands.